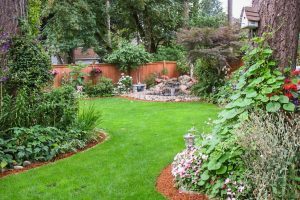 When it comes to picking the right landscape contractor for your landscape design and maintenance needs in Vancouver, WA it can be challenging to decipher which landscape company will provide you with the best service. Here at Boulder Falls, we understand that you have options when choosing a landscape contractor, which is why we always have references readily available for our potential customers. We believe in transparency and we want to provide you with all the information you need to make an informed decision about which landscape designer you believe to be the right fit for you. In this regard, we also proudly offer free estimates for landscaping projects. We understand that getting the most value for your money is important, and we want you to feel good about choosing us for your new and exciting landscaping endeavor. Another highly sought-after landscaping construction service provided by Boulder Falls includes the construction and installation of wood features. Wood features are a terrific addition to any outdoor living space as they provide warmth and depth to landscaping that is very enjoyable. They can appear organic to outdoor spaces as they blend in nicely and provide a sturdy foundation for softscaping. Here are just a few of the most popular wood feature options available to our valued customers in Vancouver WA. 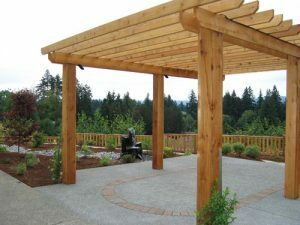 If you have your own ideas for a wooden feature to be constructed in your landscape design, let’s discuss it. Here at Boulder Falls we want to give you a landscape design that will excite and satisfy you. We can use natural or faux wood for your wood feature depending on your preferences and budget. It is our goal to use the highest quality materials possible for your wood feature landscaping construction project, and we strive to use specific materials that you request whenever possible. Depending on the wooden feature of your choice, you may need drainage services to preserve its integrity. Boulder Falls is also happy to assist with any drainage services that will be needed in tandem with wood feature construction and installation. 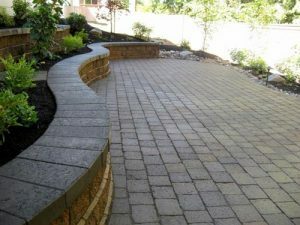 Boulder Falls offers complete hardscape construction services for any size project large or small. No matter the size of the project, you are guaranteed to get the same level of attention and service. When you choose Boulder Falls for hardscape construction services, you will get professionals that will work with you every step of the way. We also offer hardscape design services as well. Perhaps you have some ideas you want to bounce off a certified landscaping professional, or are looking for some guidance in making hardscape decisions. Whatever your landscape construction needs may be Boulder Falls wants to provide you with the best service available to you. Proper drainage of water is essential to maintaining a healthy foundation, preventing water from drowning the lawn, controlling the growth of undesirable organisms, and minimizing soil erosion. The problem is that drainage is not always easy to obtain. Perfect drainage requires changing the overall grade to a property, which is costly in terms of both labor and time. French drain systems represent one of the better options for minor to moderate drainage problems. The beauty of French drain systems is the fact that the drain can start in a small area. The water diversion can occur over an area of several square feet, which in turn allows for a greater amount of water to seep into the nearby ground. This can allow for these problems to succinctly be resolved in a way that is quick, simple and cost-effective. Boulder Falls landscape contractor will ensure the plan for French drain installation is a perfect solution for your drainage issues. One thing to understand about outdoor lighting is that it is a unique product of the individuals who install it. No two solutions are the same, and fewer are alike. Boulder Falls Landscape excels at providing our customers with lighting solutions designed to be effective, safe and easy-to-use. We can install automated systems that switch on when the sun goes down, work on a timer or allow individuals to manually turn on lighting. We can also incorporate solar lights to increase the efficiency of our designs, which in turn increases the return that our customers see when they invest in landscape lighting. The greatest benefit of our service to our customers is the way we present solutions to them. We do not select one or two options for our clients. We work alongside them to present individual lighting options while working to achieve an overall effect that is both desirable and effective with regards to the goals of the landscape lighting. Close your eyes and imagine your ideal outdoor landscape design. What do you see? Many of our customers tell us that they imagine a customized water feature as the icing on the cake. Although many customers desire a customized water feature, it can be a difficult sell because of the maintenance associated with this highly sought-after landscaping construction service. If you are in the market for water feature installation for your existing landscape, or to be added during new construction, Boulder Falls offers water feature solutions that require minimal maintenance. We also offer elaborate and extensive water feature construction services as well for those that really want to take their landscaping to the next level. When it comes to water feature landscaping constructions services, you are only limited to your imagination. If you can dream it, we will strive to make it happen. Waterfalls, water gardens, garden ponds, water fountains, koi ponds, bird baths and more! 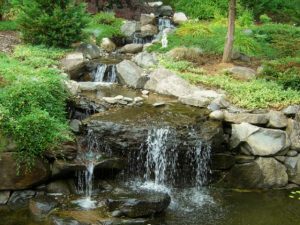 Boulder Falls offers water features of many varieties to meet your landscaping needs. The tranquil sound of a water feature also does wonders in blocking out traffic noises in busy areas. We proudly offer maintenance services for water features. Our competent landscaping contractors will gladly provide maintenance for water features that we have professionally installed. Boulder Falls would be delighted to keep your water features looking and functioning at its best.